Hopkins Public Schools turned bright orange on Oct. 25, in recognition of Unity Day, which is an initiative in conjunction with National Bullying Prevention Month. Hopkins Public Schools swapped out its royal blue for bright orange on Wednesday, Oct. 25, in recognition of Unity Day and took a collective pledge to be Upstanders. Unity Day is the culminating event during the month of October, which is National Bullying Prevention Month. The nationwide effort encourages people to dress in the color orange and recommit to speaking up against bullying. Across the Hopkins District, schools incorporated classroom lessons, activities, and other events to promote a bully-free environment. 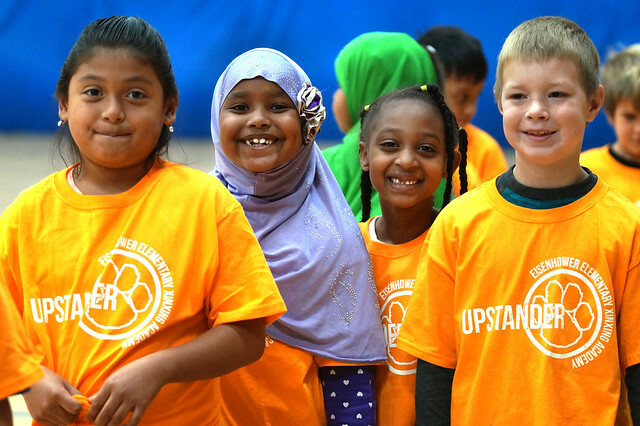 At Eisenhower Elementary + XinXing Academy, the entire student body wore their orange Upstander shirts and took their annual class photo. School counselor Travis Truhler talked to students about the importance of being a friend, showing kindness, and working together. Earlier in the week, Truhler and several students presented Superintendent Dr. Rhoda Mhiripiri-Reed with a new Upstander T-shirt. During their visit, Mhiripiri-Reed talked with students about their experiences standing up for others and the importance of being a positive influence. Over at North Junior High, AVID students hosted a lunchtime event where they encouraged fellow classmates to make the Upstander pledge. Ninth-grader Yaneli Castaneda, 14, handed out buttons and orange wristbands, and also encouraged students to make a pledge to end bullying. “We just want to show kids that we’re here for you, and that together we can make a change,” she said. “It’s cool to see us all come together and include everyone." AVID coordinator Angela Wilcox said AVID 9 students came up with the idea to host the pledge-a-thon. Seventh- and eighth-grade AVID students also helped run a selfie station, put up posters, and encouraged people to participate. The anti-bullying campaign doesn’t stop here. Schools in the District recognize different unity day events and bullying prevention activities throughout the school year. So don’t put your orange away just yet.